You never know WHAT you might find on vacation in Hawaii! Case in point: According to the Hawaii Department of Land and Natural Resources (DLNR), back in July, two visitors from Texas discovered Hawaii petroglyphs on sandstone off the Waianae Coast on Oahu. And, now State and U.S. Army officials say they will be working to protect them. DLNR says that Lonnie Watson and Mark Louviere, both from Fort Worth, Texas, say they wandered to the coastline to watch the sunset, when they saw something they say has humbled and blessed them. “For some reason there was a beam of light…just a beam…it landed right on one of them and for some reason I just turned my head. I said, look, it was just a stroke of luck,” Watson told DLNR. 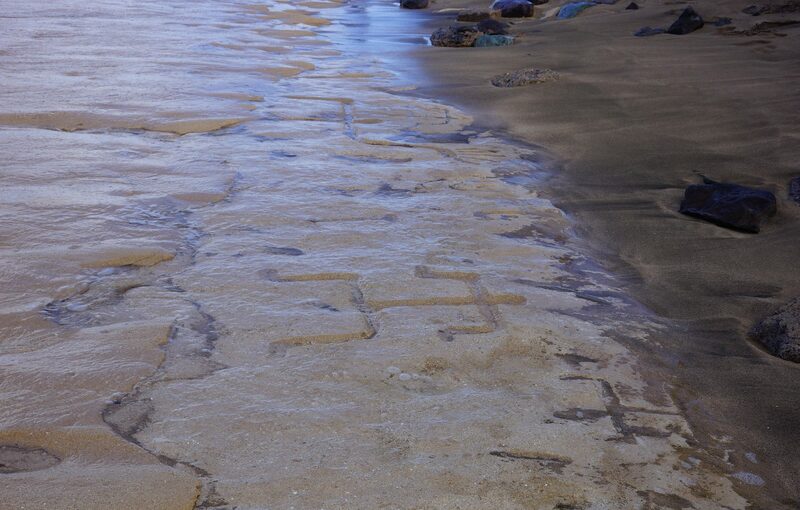 The Army in Hawaii manages several thousand archaeological sites, but this is the first one with petroglyphs directly on the shoreline. DLNR says they discovered at least 10 figures stretching over about 60 feet of beach. “They record our genealogy and religion. It’s very important to know about the lineal descendants of the area and their understanding of these petroglyphs. The interpretation of these petroglyphs can only be interpreted by the lineal descendants who are familiar with its history and culture,” Glen Kila, who is a lineal descendant of the families who first settled in Neneu on the Waianae Coast, told DLNR. His family home is a short ways from the petroglyph field, and he told the news station that, until now, he was unaware of these particular figures. This is the first time these petroglyphs have come to the attention of the Department of Land and Natural Resources’s State Historic Preservation Division and the U.S. Army, according to DLNR. Both agencies have been working together to record and document the petroglyphs, which now number at least 17 figures. 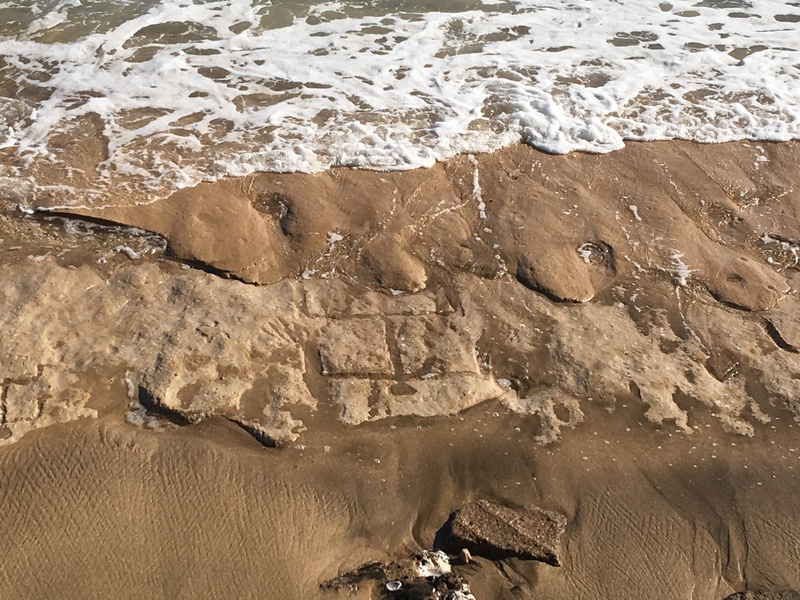 “What’s interesting is the Army in Hawaii manages several thousand archaeological sites, but this is the first one with petroglyphs directly on the shoreline. What’s exciting for me, is I grew up coming to this beach and now as an archaeologist working for the Army, helping to manage this site, we discovered these petroglyphs that have never been recorded. Some people have said they’ve seen them before, but this is quite a significant find,” Army archaeologist and Waianae native Alton Exzabe told DLNR. State officials are encouraging people not to touch the petroglyphs. Even using your hand or using a brush to move the sand off of the petroglyphs can damage the integrity of the figures. However, you never know when YOU might discover petroglyphs or another historical find when in Hawaii. When you book an Oahu Circle Island Tour, a Big Island Circle Island Tour, or a Kauai Jeep Tour, ask your guide to take you to some off-the-beaten-path areas, and have an archaeological hunt of your very own. You never know what you might find! According to DLNR, the petroglyphs were only viewable for a short time. Since the Texans' initial reporting, the sand has moved back in to cover them. “We can now come up with a plan to further protect and preserve this site. The ones with the fingers, for me, are pretty unique. I believe there are some elsewhere with fingers, but fingers and hands are pretty distinct, as well as the size of them. We find a lot of petroglyphs that are a foot or so tall, but this one measures 4-5 feet from head to toe. It’s pretty impressive,”Exzabe told DLNR. The Hawaii petroglyphs were only viewable for a short time. Since the Texans’ initial reporting, the sand has moved back in to cover them, the news station reports. Once they’re recorded and preserved, there may be an opportunity to view them up-close. So, stay tuned for more info about this amazing new find!